Question: Guess what happens when you run behind your big brother while he's on a swing? Answer: You get hit in the face. Baby says, "Mommy, could ya at least wipe my spaghetti face before you take my picture? Check out my boo-boo eye!" My kids have been particularly bruised and battered lately as well. Kind of seems like I am not taking care of them. Or something. Ouchie is right. :( That's one of those accidents that happen in slow motion right in front of your eyes. You see it coming but are helpless to stop it. It's a good think kids have such hard heads. Ouch. Our girls like to dance in the kitchen after dinner. Socks, hardwood floors and spinning in circles...lots-a-bruises. oh, but i like the spagetti face. poor guy. Ouch. Tell him you left the spaghetti there on purpose because the orange hue really compliments the blue and purple of the injury. 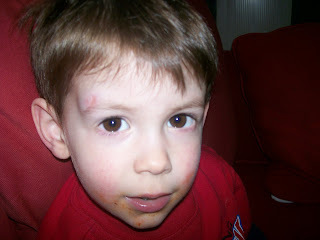 At our house, it was titled "What happens when you run behind your big brother when he is whacking golf balls?" It involved stitches. On a holiday weekend. Why I have grey hair.